We will serve you our speciali meal [Kyoh-oh cuisine Ogottsuo] with Japanese hospitality “Omotenashi”. We will create memories of Kiso for our guests. 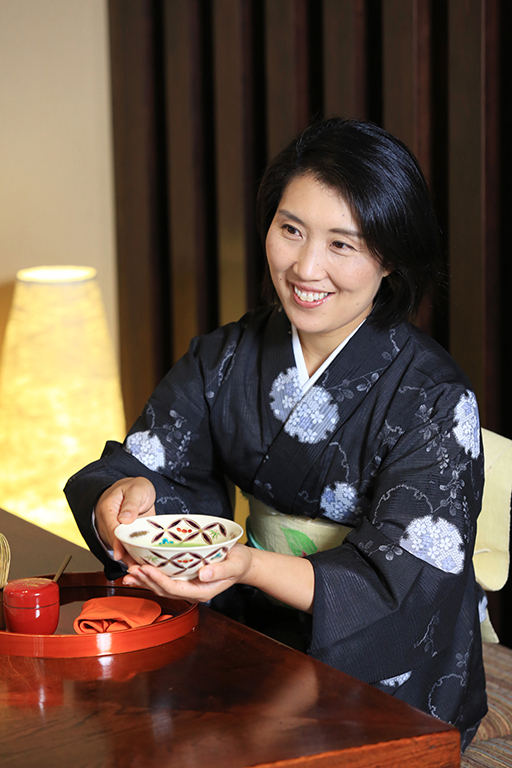 The Japanese hospitality and service “Omotenashi” of our inn. I am Mrs. Masami Miyazaki, a hostess at Tsutaya. This was the goal we set three years ago. For 14 generations, Tsutaya has handed down the traditional atmosphere of the Kiso Valley and the spirit inherited from our ancestors. We feel it is our responsibility to continue this legacy. We feel that we must protect the time-honored traditions we have inherited from our ancestors. If you are looking for a large public bath with luxurious facilities and a swimming pool, then this may not be your place. We cherish the spirit and tradition of our inn, so we serve our guests based on their needs regardless of convention. Therefore, we feel our role as innkeepers is to help our guests complete their journey in Kiso. Thank you very much for your interest in staying at our inn. We hope you will have pleasant memories during your travels. [Kyoh-oh cuisine] is a cuisine that was served to special guests who visited the Kiso magistrate during the Edo period (1603-1868). 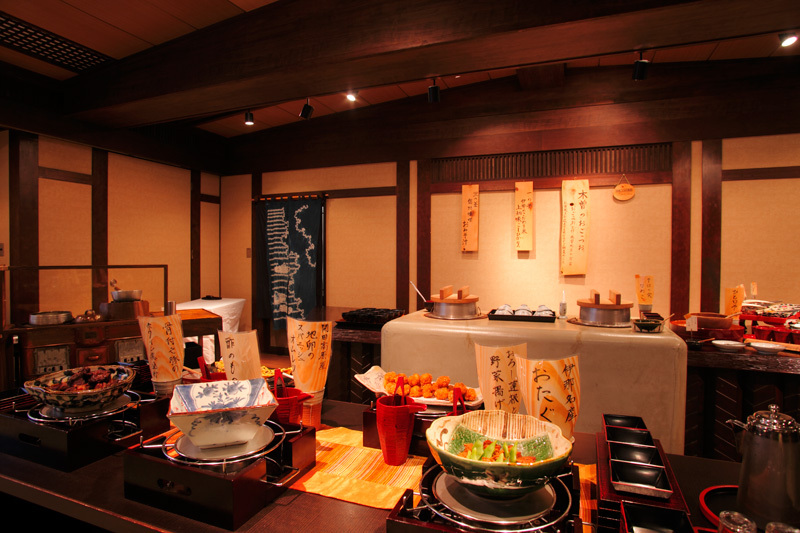 [Ogottsuo] is a cuisine that was served to the ordinary guests of Kiso. In short, [Kyoh-oh cuisine Ogottsuo] is a cuisine prepared to welcome guests with Japanese hospitality, “omotenashi” [oh-moe-tay-nah-she]. This has been passed down from our ancestors. Our cuisine uses plenty of seasonal ingredients and local vegetables, and our chefs, through precise technique and an open-mind, go beyond tradition. We hope that our cuisine will give you precious memories of your stay. 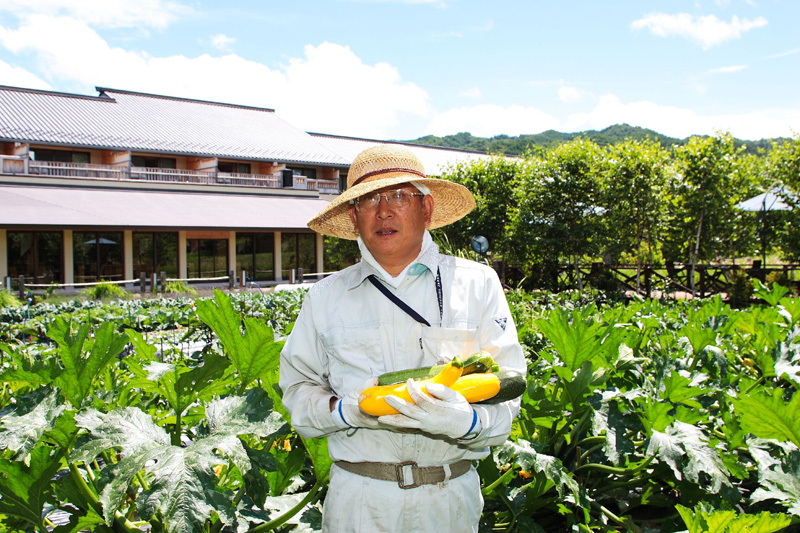 In order for our guests to have delicious and healthy vegetables, the innkeeper is always working in the garden. “Because it is what the guests eat, we have an obligation to preserve food safety.” This is what the innkeeper strives for. Our seasonal vegetables make the most of their original flavors and are filled with the innkeeper’s affection. “How did you get these vegetables so crisp?” “I am so happy that I can eat lots of fresh vegetables!” These are a few comments we have received from our guests. We hope that you can enjoy your meal. Our inn features 5 kinds of rooms to choose from. For example, there are rooms where you can feel the wind blowing in from the Kiso Road and also enjoy the sound of the Kiso River. There are rooms where you can be surrounded by the faint scent of wood. 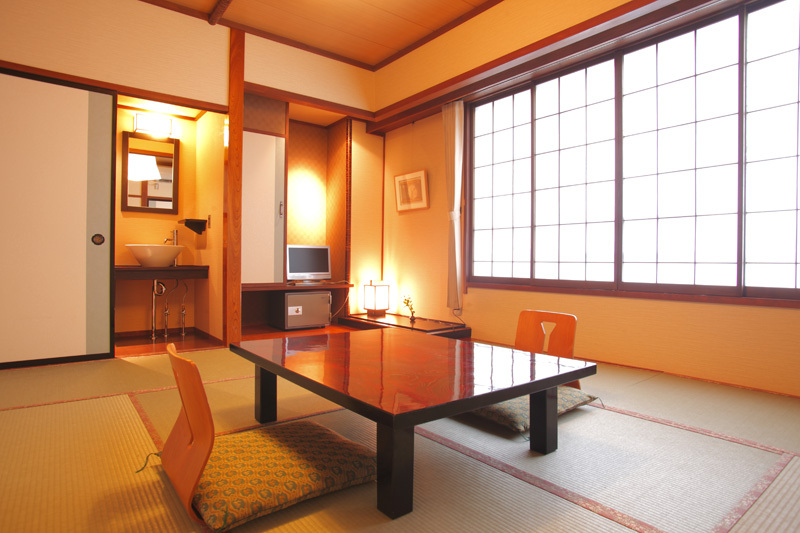 These Japanese-style rooms create a calm atmosphere. There are rooms that you can stay in at reasonable rates. Prices vary depending on the room type, but the cuisine and service are exactly the same. You can choose your room according to your budget and the purpose of your trip. What room would you like to spend your time in? 4, Our herbal bath (A bath with many kinds of medicinal herbs) has been loved by travelers since ancient times. “Hyakusoyaku” [hya-koo-so-yah-koo] is a medicinal herb that has been passed down in the Kiso Valley since ancient times and continues to be loved by the community. The herbal bath also contains Amur cork tree which was grown on the sacred mountain, Ontake. It envelopes your skin like a warm embrace. The herbal bath has healed travelers’ bodies and souls since ancient times. 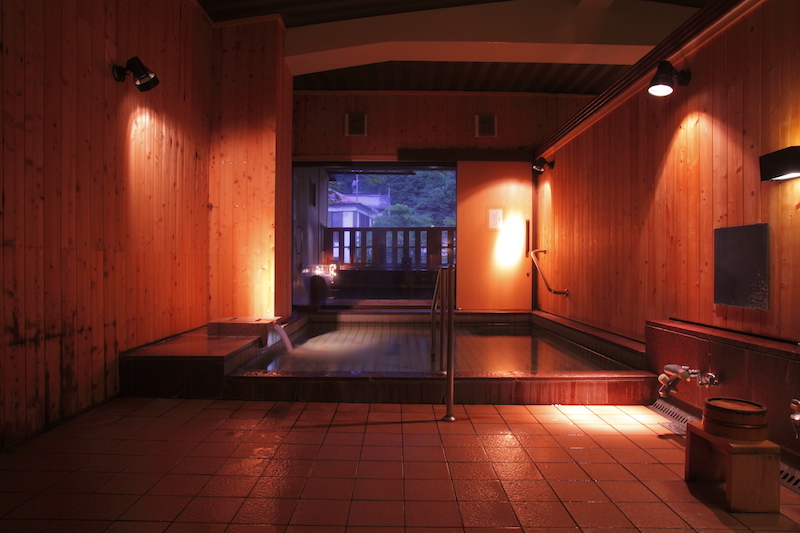 You can picture life in Kiso in ancient times while enjoying your bath. Please enjoy yourself to your heart’s content. 5, The [seh-seh-rah-gee] bath. It’s very popular with the local women! Why are local women coming here and taking a bath? Next, this spring is known to be gentle on a woman’s skin. The bath also warms the body, especially for women who suffer from poor circulation. By bathing in the morning and in the evening, you can feel your body becoming warm from the inside. Next, you can enjoy hearing the pleasant murmur of the Kiso River all to yourself. We hope you have a luxurious experience. 6, The road itself is a famous place in the Kiso Valley. Because of it’s inherited tradition and history, the Kiso Valley was rated 2 stars in the Michelin Green Guide. The old Kiso highway was once crowded with inhabitants and travelers. We hope you feel the historical charm of the old highway of the Kiso Valley. We will show you the secret spots of the valley, the hidden gems that are little known. 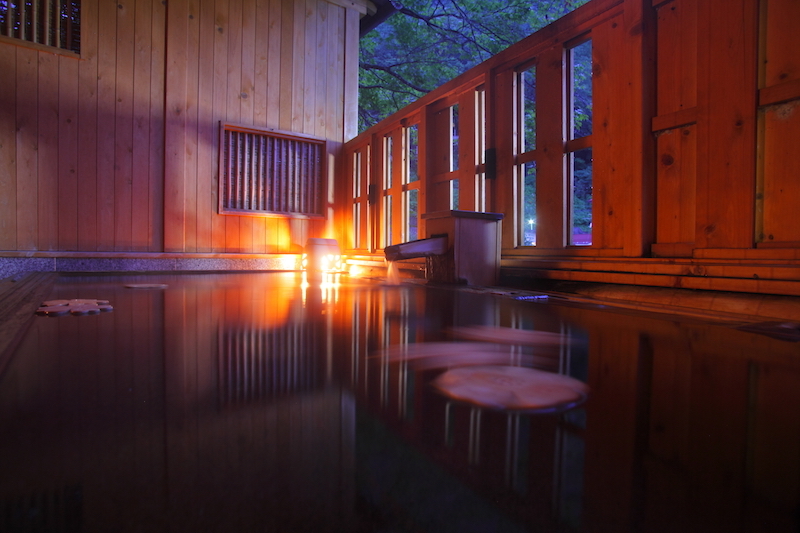 Agematsu post-town is the birthplace of the “forest bath”, a concept of. refreshing one’s body and mind through a nature walk in the forest. The Akazawa Natural Recreation Forest is protected as the source of wood for Ise Shrine, Japan’s most sacred shrine. Therefore, there are many large trees over 300 years old. There are eight forest bathing courses, and you can enjoy hiking with plenty of minus ions – natural occurring particles that are beneficial to the health. (Certified by the Forest Therapy Society). It takes 40 minutes by car from our inn. Narai, a post-town that flourished during the Edo period(1603-1868), is located at the foot of the Torii pass. Our inn is designed based on Narai post-town. You can find more information about local tourist spots on the “Tourist spots around here” page. 7, The moonlight will show you around the Kiso Road at night. Our young innkeeper will guide you on a night tour around Fukushima post-town, one of the 11 post towns along the Nakasendo trail. 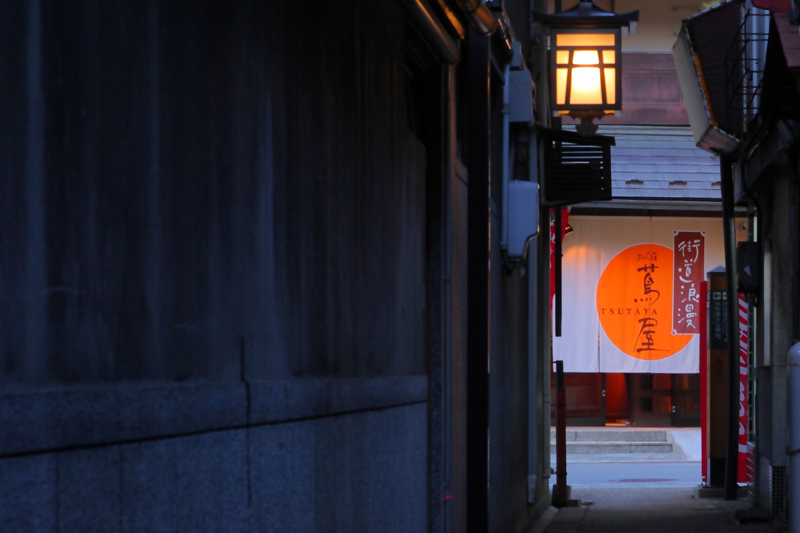 Our young innkeeper will guide you around the Kiso Road with a lantern. You can see completely different scenery from the day-time. Our Moonlight Guide has started based on this feeling, and it is very popular with our guests. Young innkeeper holds it on a whim. ※ Ask the innkeeper about joining one of these Moonlight Guides! 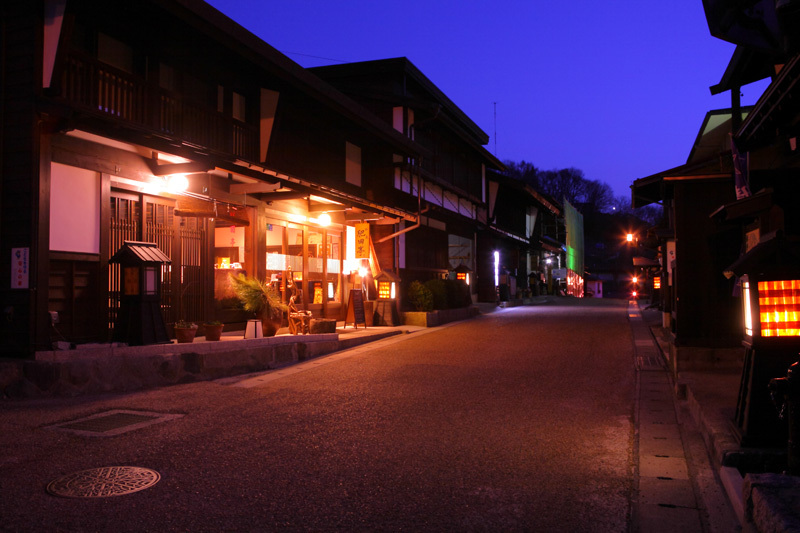 Come spend a relaxing evening in Kiso with us.